This was a great excursion. The timing of the trip was perfect. Mr Sharma, our driver, was absolutely fantastic. We felt very safe despite the chaos that is the ebb and flow to the daily traffic. We were picked up at our hotel and dropped off at the airport very timely so there was no stress in our schedule. As a special treat we added the Jantar Mantar to our excursion and are thrilled we did. This is a equinoctial sundials that is accurate to 2 secs and built in 1724 timeframe. I am still in awe of this site. Overall, it was a fantastic two days. My only complaint is we did not have more time....but that was our doing not the tour company. Driver was great and knowledgeable, and our guide had many insights. Worth going on. love it! everything was great, food, accommodations the tour was very well organized the only thing I didn't like is that felt I was lure into stores by my tour guide everywhere I went with the pretence that they will show me the process of making things. Driver was on-time and courteous. Had a bottle of water for each ready in the car. We were 2 ladies, so were relieved to find such a professional driver, and very knowledgable guide. Sanjay knew all the little things like the perfect time of day for a particular photo, and the best time to get to the fort for the elephant ride. I can not fault this tour experience - I will take it again in future, as there is so much to see! Highlight of our India Tour ! We absolutely ask that anyone visiting New Delhi and Agra Taj Mahal not overlook the amazing sights of Jaipur !!! You cant leave india without an elephant ride up to see the Amber Fort ! We decided on the 2 day option so we would not be rushed and this was a very good choice - Viator enlisted the services for our tour company and they were excellent ! We had Mr Sanjay as our guide and Nr Narender as our driver- they were with us every step of the way. We had our choice of hotels in Jaipur and we chose a Taj property the Taj Mahal Palace - wonderful palatial property. 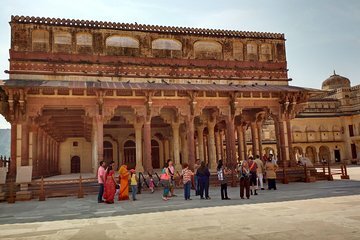 We had a detailed city tour and an in depth tour of the City Palace and Hawa Mahal. Mr Sanjay was extremely knowledgeable , affable and on top of that a great photographer ! he knew all the right angles and picture opportunities. Lunch and dinner were included and were at tripadvisor recommended restaurants which was perfect. The Amber Fort visit and elephant ride takes a whole half day to do it justice and our tour went at our own pace- There was plenty of opportunity to visit any arts and craft shops and the company was completely open to our decisions. We elected not to visit any shops as we had already done our shopping and this was respected by Mr Sanjay - he was open to any suggestions we had on what to see and kept reinforcing the company motto that he was there to make this a memorable visit for us. 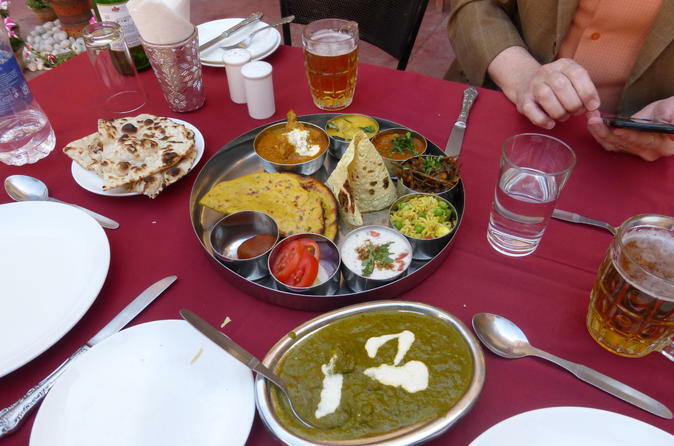 The drive to delhi takes at least 4-5 hours depending on the time of day but the car was very comfortable and air conditioned and Mr Narender stopped along the way as we needed for food and rest stops. The guide was excellent ad the driver very skilful. The hotel was not good as the promised three separate beds were not provided and the dining room did not know that the food was already paid. Our tour guide Rinkoo was amazing. He was very enthusiastic and his tours and history lectures were very easy to understand. He is highly recommended and this tour was phenomenal! Wonderful and relaxing tour.Since we stayed overnight in Jaipur , it was easy going to complete the tour at ease.The City palace , Hawa Mahal in the lake , Hawa Mahal in the town were wonderful. The trip to Amber Fort was marvelous and new experiencing riding on the top of elephant.